1. Should I continue along the same path as before by forming another "new-grass" band? 2. Do I follow my muse and focus my efforts on taking clawhammer banjo into uncharted territory? 3. Maybe focus on another passion of mine, the folk music of the West? I set up some parameters for this new band and started searching for songs. Fortunately I didn't have to look far; I’ve always had an interest in "western" songs and already had a good number in my repertoire. 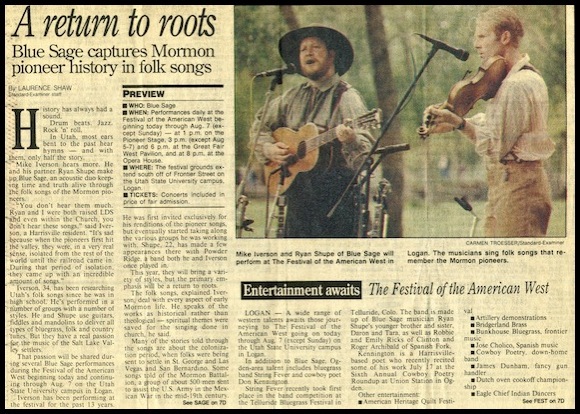 I soon contacted fiddler Ryan Shupe, who had played in Powder Ridge with me, and Blue Sage was born. In addition to being one of the most gifted musicians I'd ever heard, Ryan was attending Weber State University near my home and was available! The duo was soon playing shows all over Utah. While Ryan and I got Blue Sage up and running, my wife, Shauna, was working on the bass fiddle. I may be a little dense, but after watching her receive numerous offers from bluegrass bands in our area, I finally caught on to the idea that she might be a good addition to Blue Sage! The duo became a trio. Ryan eventually left the band to pursue his own career in music and I was fortunate to find another equally amazing fiddler to take his place. I'd watched Rob Ricks grow into the only fiddler who could fill Ryan's shoes, and I was humbled that he was willing to take Ryan's place in the band. For those familiar with our 'Live At The Junction Theater' CD, Rob is the musician responsible for the incredible fiddle work on that album. About fifteen years into the Blue Sage saga, Rob left to get an MBA at Yale, and once again I found myself without a fiddler. Fortunately, I had grown one of my own! My eldest daughter, Heather, had grown up with Ryan and Rob's fiddling and to my delight, I found that their unique styles had rubbed off onto her and she was able to slip right into the band when Rob left! Although I'd been fronting the band with a banjo, most of our instrumental work had been constructed to showcase the fiddle. With the popularity of my clawhammer teaching site continuing to grow, I felt that the banjo needed to take the lead instrumental role in Blue Sage. 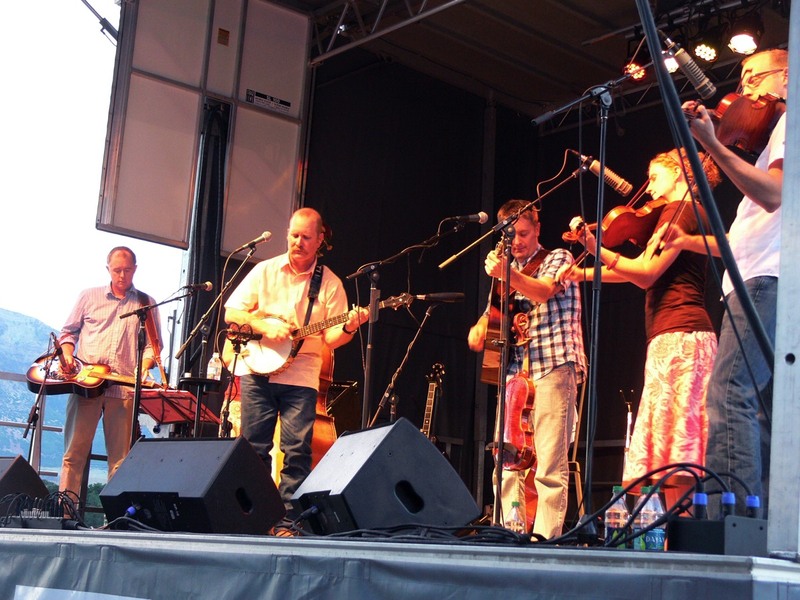 I knew that if I could shift the focus of the band toward a new-grass/bluegrass sound, it would effectively complete the remaining two goals on my list! Fortunately, I was able to enlist the aid of some world class musicians to make this happen. I've been blessed with some truly amazing talent in my bands, musicians such as Matt Flinner, Ryan Shupe, Rob Ricks, Ken Sager and Jake Workman, without who's help I would never have been able to achieve my dream. I am humbled that players of this calibre have been willing to join me in introducing a full fledged "new-grass" band fronted by a clawhammer banjoist! About this same period in time, the pop band Rosewood invited me to fill in for their keyboard player (yes, on banjo) for a few gigs. The rest, as they say, is history. I've now been playing with Rosewood for over four years! I'm constantly amazed at how well the banjo fits into contemporary pop. The heart and soul of Rosewood is Shaundra Cragun, an exceptional singer, songwriter and guitarist. Here's a poor recording of an exceptional original number penned by Shaundra. It's now been a quarter of a century since I picked up the phone to talk Ryan Shupe into forming Blue Sage with me and the band is still going strong. Ryan, as do other ex-members of the band, occasionally joins us on stage for special events! This is something we hope continues as long as Blue Sage is around. 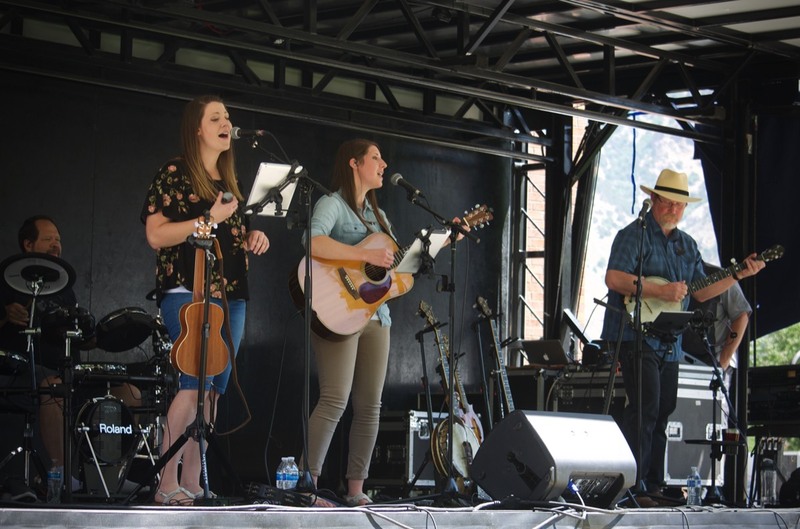 Why Hire The Blue Sage Band? We pride ourselves in being personable and adaptable and we always try to accommodate the wishes of those who have hired us. We always dress appropriately. Our costuming is usually "nice western" but changes if the presenter wants another theme (old time cowboy, pioneer, nice casual, etc.). The music of Blue Sage appeals to all age groups. We can provide our own professional quality sound reinforcement which you are welcome to use for announcements. 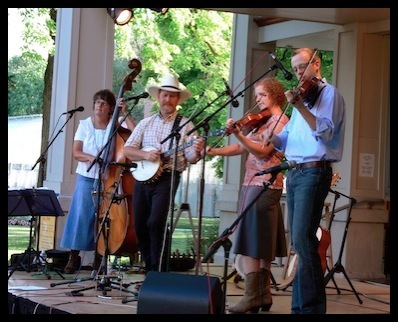 Our instrumentation is based on folk and bluegrass stylings but our songs are rooted in the western tradition and therefore perfect for 'western' themed events. 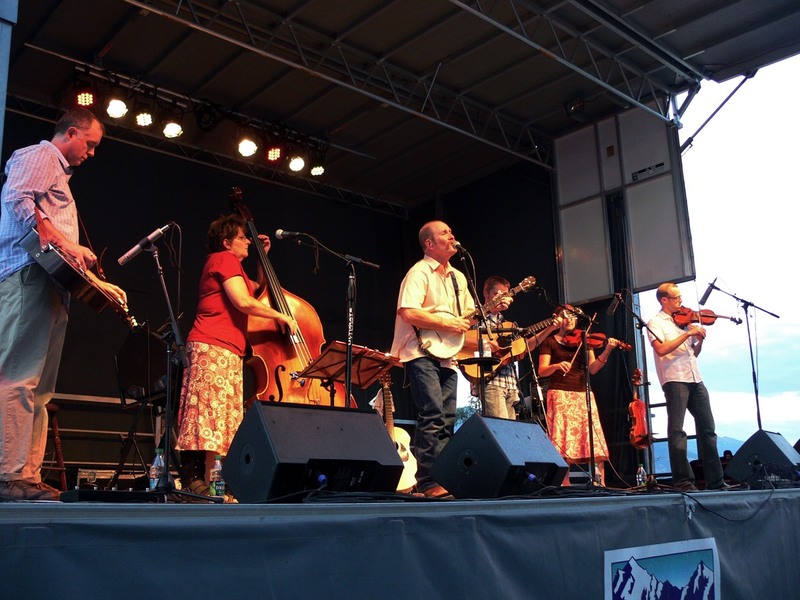 Blue Sage concert followed by an old-time barn dance. Western themed show with a world class cowboy poet.